A recent phenomenon; massive explosion takes place at the base of the plume where molten lava is pumping into the ocean on the Island of Hawaii. 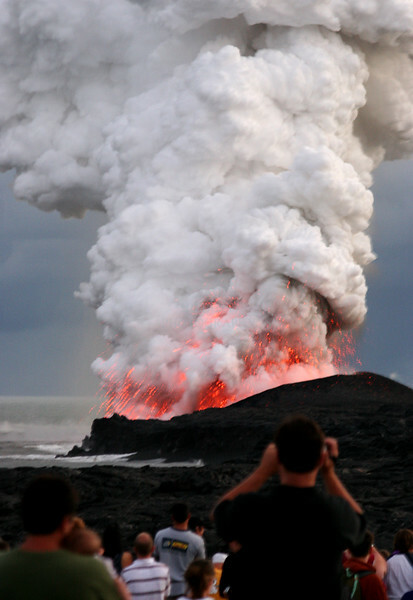 The plume is comprised of steam, sulfur dioxide, hydrachloric acid, glass particles, ash, rock, and black sand. As the molten lava pours out of the lava tubes that carried it from magma chambers under the flanks of Mauna Loa’s Kilauea volcano above, it instantly explodes into black sand and rock fragments. Many of these molten chunks will continue floating and streaming on the ocean. This is the most ocean entry lava that has been seen here in local memory.